Can you see the book tucked underneath the devil’s star? It’s Stieg Larsson’s The Girl Who Played With Fire, and in my opinion that’s where she belongs: underneath Jo Nesbø‘s third book. 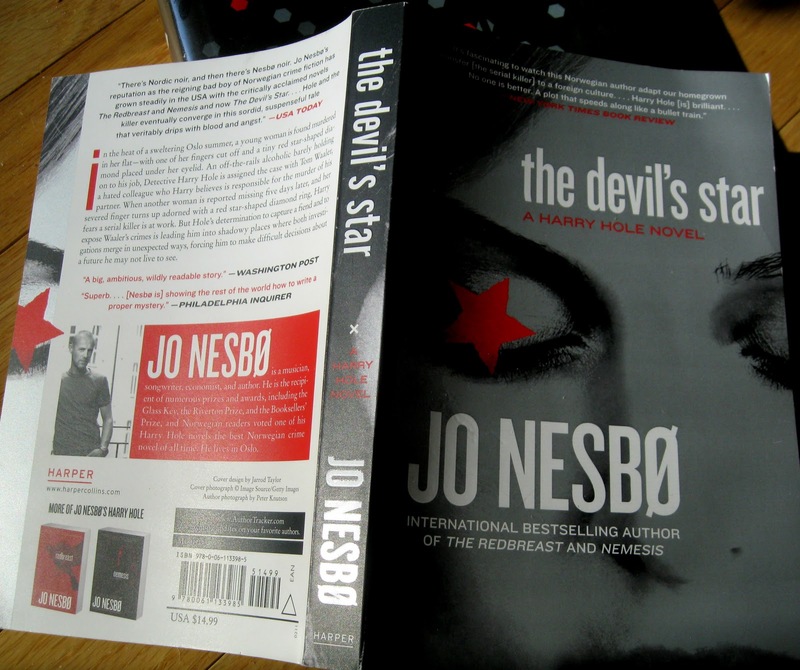 In all the hullabaloo about Scandinavian crime writers, one must face the fact that for many, Nesbø does it best. the devil’s star is filled with everything that makes this genre thrilling: psychological intrigue, gory crimes, and interpersonal struggles between the characters. Most interesting to me is the hero, Harry Hole, whom I wanted to scorn for his dependence on alcohol and yearning for pills, but couldn’t help admiring for his perseverance and skill. His despair over the relationship with his love, Rakel, let alone life itself, made him even more compelling to me than the murderer. About whom I cannot tell you much lest I spoil the surprises. The surprises are abundant; interwoven between blood diamonds in the shape of a star, pentagons, and the occult, we find rituals, jealousy, subplots and danger, all of which make this novel riveting. If you liked Larsson’s work you’ll love Nesbø’s. If you wonder what all the fuss is about with The Girl Who Whatever, you’ll simply be amazed. When people say that what I’ve done is insane, that my heart must be crippled inside, then I say: Whose heart is more crippled, the heart that cannot stop loving or the one that is loved but cannot return that love?